A private company responsible for conducting research on pesticides has paid a US government agency to prove that some chemicals in question are in fact safe. 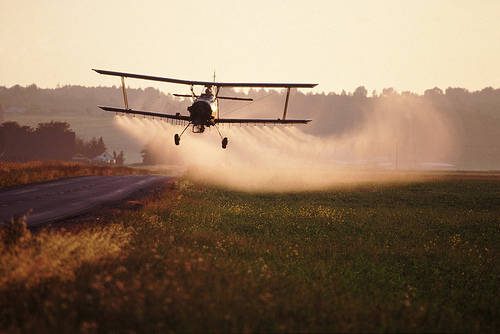 In an unusual scenario that raises questions of conflict of interest, a company that conducts research on behalf of the pesticide industry has paid a US government agency to help prove some controversial chemicals are safe. The company, Exponent Inc., based in Menlo Park, Calif., is known for its scientific research on behalf of corporate clients facing product liability concerns. In this case, Exponent is trying to refute research showing that even a small amount of combined exposure to two agricultural chemicals, maneb, a fungicide, and paraquat, an herbicide, can raise the risk of Parkinson's disease, a progressive disorder of the central nervous system. The federal agency involved in this instance is the National Institute for Occupational Safety and Health (NIOSH), a division of the Centers for Disease Control and Prevention. Federal ethics rules generally prohibit government employees from accepting money from businesses related to their jobs, which helps ensure that government staffers remain unbiased and free of corporate entanglements. Although NIOSH has statutory authority to accept 'gifts,' it does not “utilize” that authority to accept corporate donations for research, according to an agency spokeswoman. Science-for-hire firms, Caplan says, must by nature be attentive to the needs of their corporate underwriters. Caplan is not alone in his view. In his 2008 book, “Doubt Is Their Product: How Industry's Assault on Science Threatens Your Health,” David Michaels wrote, “While some may exist, I have yet to see an Exponent study that does not support the conclusion needed by the corporation or trade association that is paying the bill.” Michaels, who wrote the book before becoming assistant secretary of labor for occupational safety and health, declined to comment for this story. The project originated as a piece of a study funded by the UK Department for Environment, Food and Rural Affairs (Defra), the environmental arm of the British government. Records show that Exponent received a $1.5 million (906,552 British pounds) contract to oversee a study investigating the mixture of chemicals maneb and paraquat and whether or not they raise the risk of Parkinson's disease. Parkinson's disease results from an insufficient amount of dopamine in the brain, among other changes. Dopamine is required for muscle control, and people with the disease tend to develop tremors, slowness and imbalance, among other problems. They may also experience depression, anxiety and sleep disorders, as well as memory loss and decline of intellectual function, according to the Parkinson's Institute and Clinical Center. The Center is an independent, nonprofit organization in Sunnyvale, Calif., that performs research and provides care. In the past 10 years, a growing body of research has shown that even brief exposure to pesticides, both at key points in a person's development, or in later life, raises the risk of getting the disease. Among the most influential work was research done by Deborah Cory-Slechta of the University of Rochester and Rutgers University. Cory-Slechta, working on mice, showed that exposing animals to a mixture of both paraquat and maneb significantly raised their odds of developing signs and symptoms that resemble the disease. In another study, mice that were chronically exposed to low levels of the two pesticides moved less often than mice that were not exposed. Cory-Slechta's work was published in prestigious peer-reviewed science journals, including “Environmental Health Perspectives.” Since then, others have built on her research. In 2009, researchers in California found that exposure to the mixture of maneb and paraquat also significantly increased the risk of Parkinson's disease in people. The study found that individuals who were exposed to both chemicals within 500 meters (547 yards) of their homes had a 75 percent higher risk than those who were not exposed. Both chemicals also carry other health risks. But the chemicals remain big business. Paraquat, which is used to kill weeds, is banned in Europe but is permitted in the US, where some estimates put sales at $1 billion a year. Maneb, which is used to prevent crop damage in the field and to protect harvested crops from deterioration, is being phased out in the US but is allowed in Europe. From numerous interviews with manufacturers' researchers it is clear they are worried about liability from individuals who believe they have developed Parkinson's after using their products or being exposed to the chemicals in food or in their environment. Although it is common for scientists to attempt to replicate or build on each other's work, Exponent's McIntosh seems particularly committed to refuting the research linking Parkinson's disease to pesticide exposure. In an interview, she was open about her skepticism on the causal relationship between pesticides and Parkinson's. For example, she believes that some of the loss of movement that Cory-Slechta observed could be attributed to mice just “feeling sick” and lethargic after ingesting pesticides. McIntosh's earlier work, partially funded by CropLife America, found no association. Cory-Slechta, who serves on the EPA's advisory committee on Science Integration for Decision Making, and recently chaired the agency's review panel on Trichloroethylene, believes Exponent's work is designed to benefit its chemical industry clients. “Obviously, this has huge implications for the manufacturers, financially,” she said. The scientist also said that AstraZeneca, which combined its agricultural chemicals business with that of Novartis in 2000 to launch Syngenta, initially supplied her with paraquat but stopped after her team began publishing their work. Sasha Fuller, a spokeswoman for the British agency Defra, defended the selection of Exponent for the UK study. “The laboratory in question published multiple papers strongly suggesting an association between the chemicals paraquat and maneb and Parkinson's in injected doses in mice,” she said in an e-mail. “Defra considered them of sufficient concern that we commissioned the research project in order to see if the results could be replicated under conditions likely to occur in a realistic setting ie when exposed to the same levels and in the same way as people might be in a real world scenario, rather than by injection.” Cory-Slechta and other Parkinson's researchers say this approach may not yield relevant results because mice have a far shorter life span than humans and different physiology, and that this approach is intended to be a distraction from the real issues. Fuller also said it wouldn't be practical for Defra to ban consultants who work for industry. “Exponent won the tender for this research because they had the required UK and European expertise, provided value for money and had the capacity to deliver,” she said. But British environmentalists note the UK's strong agricultural chemical industry — and frequent disagreements with the more environmentally conscious European Union. “The UK as a nation is pro-chemical industry. We have a big manufacturing base that generates a lot of money for our treasury,” said Elizabeth Salter Green, director of CHEM Trust, a British-based environmental group. Congress authorized creation of the National Foundation for the Centers for Disease Control and Prevention in 1992 to solicit donations from outside the government to help protect public health. It incorporated in 1994. The foundation's largest donation to date was $25 million from the Bill & Melinda Gates Foundation to fund disease detection work in Central Africa in collaboration with the World Health Organization. But Exponent's McIntosh acknowledges that it was she who brought the project to O'Callaghan. His lab is performing the study's stereology — a method of analysis that uses random, systemic tissue sampling and statistical math to provide quantitative data, rather than examining every cell. This research is a crucial part of the Parkinson's study. He also said he believed the work in progress supports previous studies showing a correlation between exposure to pesticides and Parkinson's disease. McIntosh, who is participating in the project, took issue with that conclusion. “It's premature. We haven't finished the analysis,” she said. “What we have at this point is a trend...He's talking about something that's incomplete. It's like saying 50 percent of the votes have been counted. It really doesn't tell you what the final result will be.” She also said that Exponent puts up a “firewall” between researchers and funders on individual projects. Craig Holman, government affairs lobbyist for Public Citizen, the Washington, D.C.-based consumer advocacy group, also found the arrangement troubling. Exponent's participation is clearly a sensitive issue for the CDC Foundation. After numerous press inquiries, the Foundation took the project off its list of current programs. When asked about the deletion, spokeswoman Ruddon said that NIOSH's role in the project was finished. Yet in an e-mail on Monday, McIntosh said she was still awaiting the final data set from NIOSH, and did not expect it until later this month. She also said that as co-authors of an eventual publication, the NIOSH staffers will continue to be involved in the study. This story was co-published with the Investigative Reporting Workshop. Sheila Kaplan is a senior writer for STAT, Boston Globe's health venture, covering the intersection of science, money, and politics.